Are you technically allowed to play Kongming in a dragon deck in a format like Tribal Wars or Tribelander as an on-theme support card? Personally, I’d let you do that, as it feels fitting. There aren’t many dragon creatures that really need to be boosted by an anthem, but sometimes every little bit counts; my impression of formats like that is that dragons are actually disfavored in a race against a deck like krakens! It will, however, be more common to see Kongming as an extra Crusade effect in aggressive white decks. You know how much I like the versions of effects that can attack and block (cf. Dark Confidant vs. Phyrexian Arena; Phyrexian Revoker vs. Pithing Needle; Corpsejack Menace vs. Hardened Scales). While he can become collateral damage in the face of ever-ubiquitous creature removal, he can also wield a Loxodon Warhammer, soulbond with a Trusted Forcemage, or soar with Elspeth’s anthem (and I think his crown even counts as a hat if you have a Goblin Haberdasher in play). That’s well worth the mana cost, if you ask me. Plus, his reappearance as an uncommon legend in the Masters set seems to be both a callback to Kamigawa and a foreshadowing of Dominaria . . .
One of the many legends in Portal Three Kingdoms to depict historical figures from Chinese lore, Kongming plays out fairly simply: as a Glorious Anthem effect stapled to a 2/2 body. 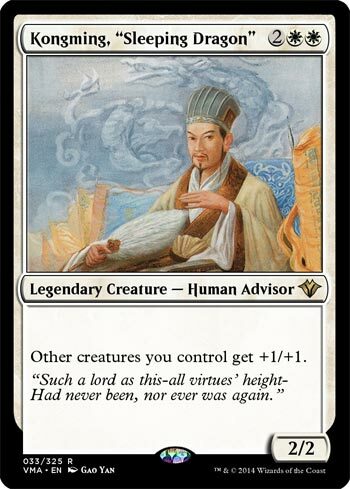 I’m not thrilled about Kongming being four mana, as it is a shade higher than you ideally want for the effect, but another iteration of the effect is not a bad thing in a white deck that wants to go wide and send massive waves of creatures crashing in. He’s not flashy, but he’s a solid enough card in the deck that wants him. And at uncommon in Masters 25, it’s well possible you’ll see him often enough to justify going white.